Other browsers have had it for years, but Chrome is finally adding a “Reader mode” that strips down an online article to its most essential parts—images and text—to make it easier to read. The new feature, dubbed Distill, is currently a work in progress but is still worth trying out for full-time Chrome users. Here’s how I enabled the Distill feature in Windows 8.1. 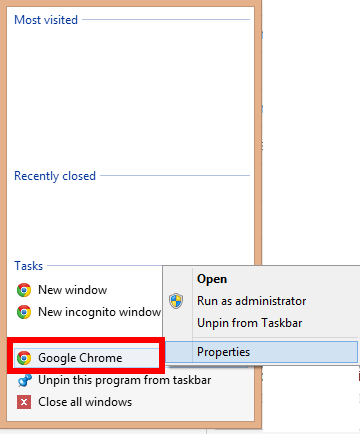 Now shut down Chrome completely by opening up your system tray (the upward facing arrow on the far right of the taskbar), right-clicking the Chrome icon, and selecting Exit. 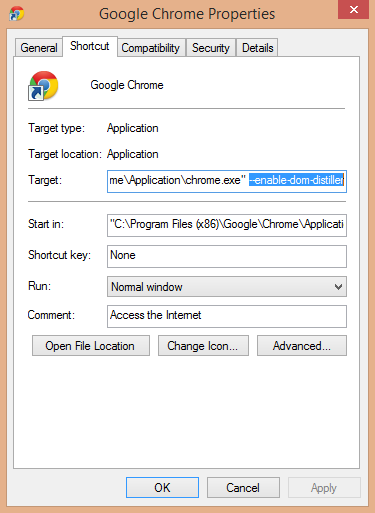 To start with Distill mode you need to access a Chrome shortcut’s Target setting. Next, right-click the big Chrome icon in the taskbar and highlight Google Chrome. (Don't click it yet!) It should be the third choice from the bottom. With the selection highlighted, right-click again and select Properties, as shown here. Still with me? Good. That was the hard part. Make sure you type that in exactly, with two dashes at the beginning. You can cut-and-paste the above text into the field if you'd like. You’re done. It may seem like a lot of steps, but it only takes a few seconds. Your properties window should look like this when you’re done. Now open up Chrome and click the “hamburger” menu icon on the upper right side.There should be a new option that says “Distill page.” Select “Distill” when you’re viewing an article online and reading gets a whole lot easier. The new feature is pretty bare bones right now and doesn’t include anything fancy like the ability to save articles to a “read later” list. If you’re a Chrome user, but setting up distill mode is too much work, there are alternatives. Evernote fans can install an extension from the Chrome Web Store called Clearly that does the same thing and even lets you save stripped down articles to Evernote. The modern UI (read: Metro) version of Internet Explorer 11 also comes with a reading mode button. The desktop version of IE does not contain the same feature, however, and IE has to be your default browser before you can access the modern UI version in Windows 8 and 8.1.